Generally speaking, I’m not a re-reader. Yes, I did read Treasure Island somewhere around three times in junior high, but that was then. There are just too many books out there that I haven’t read yet. I love to go to the library and wander through the aisles until a book jumps out and begs me to read it. I love the smell of an old, musty book that has been in the library for thirty years and the brand-new ink-and-paper smell of a fresh book from the bookstore. 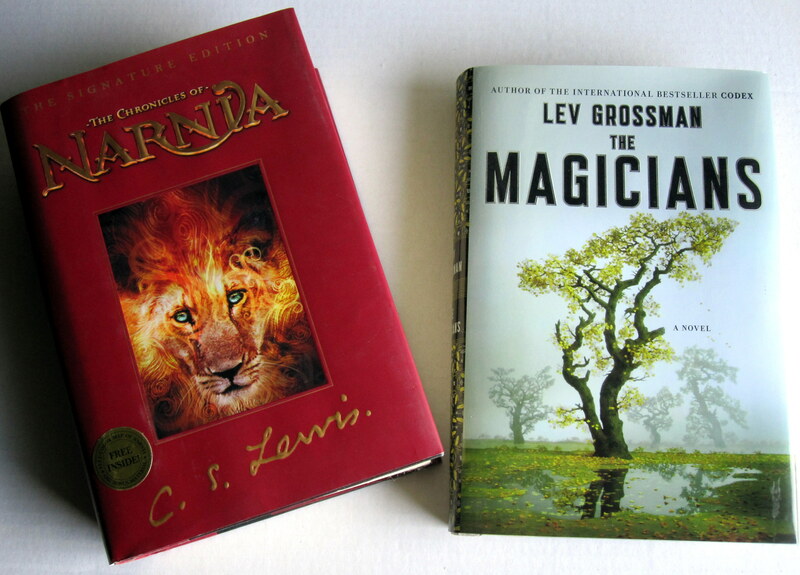 Yesterday I finished reading The Magicians by Lev Grossman. It follows the story of Quentin, a young man who feels a bit lost in life and is about to enter college. Even though he ends up stumbling upon a college for magicians, he still finds himself dreaming of Fillory, a world he read about as a child. Basically, Fillory is Narnia. Grossman changed the names to protect the innocent, but it’s all there. Instead of a lion there are two rams, the Watcherwoman takes the place of the White Witch, and there are fantastical creatures galore. The young boy in the books even gets to Fillory through an old grandfather clock, which is just a bit reminiscent of the wardrobe. While I can’t say that The Magicians was my favorite book, it was good. The characters were very well fleshed out, the imagery was great, and I wanted to see what happened. Take a peek at my personal library, won’t you? There was just one problem: I finished it, and I didn’t have anything else to read. This isn’t a problem that I’m usually faced with, since I usually have something lurking around the house that I’m interested in. There are a few books on the shelf that I haven’t read yet so I scanned through them, but they just didn’t appeal. What I did have on the shelf was The Chronicles of Narnia by C.S. Lewis. I’ve read them before. I loved them. Several times I’ve thought about re-reading them but have always resisted. Reading about the pseudo-Narnia that Lev Grossman created made me want to re-read them even more. I went to bed without deciding. Today, when I’m done with writing, working, cooking, cleaning, and the general chaos of life, it will come down to the final choice: Narnia or the library?